If you are interested in owning a customer facing, fun and flexible lifestyle business – there’s few opportunities quite like running your own Skate School. As well as private and group skate lessons, you’ll be running after school skate clubs, roller discos, skate parties, festivals, play schemes, trips and even skate holidays! This is not just a summer job. Once trained you can expect to start making money immediately with year round steady opportunities and plenty of expansion potential. You’ll have a business and training resource to call on, to assist in all aspects of your business as well as your own space on the website, access to our £10million public liability insurance and all the other documents schools and councils require. The Franchise fee for SK8school is from £5000 – £15,000, depending on your desired annual income and starting point. 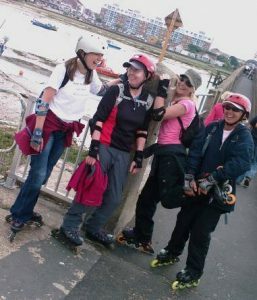 You can expect to pay less if you have relevant skating experience and qualifications, or have access to suitable transport or equipment. Most of the investment goes towards equipment, transport etc. so can be put off until required as the business develops. Additionally the initial payments can be made in installments, which makes the startup more accessible and reduces risk. Once up and running you pay a modest fee of 11% monthly turnover, with decreasing percentages as you income expands. So your payments will be affordable at startup and easily sustainable once you are established. Ideally you’ll have experience or interest in the Sports and Leisure industry, preferably with a skating qualification or good level of practical proficiency. Good physical health and ability to drive are essential. You’ll need a great enthusiasm for working with children especially in the 5-12 year age range. Might well suit someone looking for a full time flexible life style job or part time job supplemented by another income, depending on your desired level of involvement. Marketing and dealing with all those calls! Street Skates, Treasure Hunts, Festivals etc. It would be essential to source first aid training locally before embarking on this course and to ensure you have a DBS check processed.